NOAA was calling for 10-15 knot winds out of the west, with 2-3ft seas. They were pretty close this time, but there was very little wind. We headed out with a group from The Dive Shop for their first trip to the Stolt. The usual suspects tagged along for the ride. We made good time on the way out as the seas were near flat. Bill had us tied in quickly, and the groups started getting into the water. Once in the water, you could see the wreck quickly. With no current or wind, the line dropped straight down to the tie in. On the top there was clear water, but you could see the thermocline below where the vis dropped to about 20 ft. I chose to take video this trip, and was rigging the lights on the way down. In the still water, it was easy to drop into some of the large holes in the wreck and film inside. On the bottom, there was not much to see, other than a few ling cod and eelpouts. Most fish are spooked by bright lights, ling don’t seem to mind. They will even come toward the light. Perhaps they are using the light to look for food. In any event, they are not camera shy. Swimming along the side of the wreck most of the anemones were out in bright colors. Swimming through some of the upper decks you could see the water mixing in the thermocline. Large schools of cunners darted around, and some large tog swam with them. The port side was above the thermocline. There was a slight surge here, so the school of cunners swayed back and forth with it, looking for some morsel of food to be blown off the wreck. I spent some time passing back and forth through these passages tracking the movement of the school. Like the ling, cunners are not camera shy. Some would even come up to the lens, and try to nip at their reflection. The camera was out of video tape, so I headed up. Just under the boat, there was a fish swimming back and forth. To my surprise and delight, it was a large trigger! When I hit the surface, I handed up the camera, and someone handed down a pole spear. I quickly invited the trigger home for diner. An invitation he could not refuse. Ocean triggerfish often arrive in August, brought up in the warm waters of the Gulf Stream. It’s uncommon to see them this early in the season. Back on the boat, Rob made his usual long dive, and returned with a large bag of scallops. Bill returned with lobster. Mark and John had been digging inside the wreck. Mark returned with some jars with what appeared to be Norwegian writing. Luke grabbed a bag of mussels. The rest returned with stories of the great conditions, and how good a dive it was. A few reported seeing dogfish above the wreck. For the second dive, Rob timed his scallop cleaning so that other divers would be on the line. They were entertained by the sight of the dogfish darting after the shells and parts. We were soon on our way back to the dock after another great day of diving. Saturday the Independence II headed out to the Gulf Trade. We enjoyed flat seas, little to no breeze, and clear skies on the way out. This should be a great day! Frankie had us tied into the wreck quickly, and the divers started to jump in. In addition to lobster and Sea Bass, reports came up of 48 degree bottom temp, and visibility of 25ft. I opted to bring in the camera rather than the pole spear. It was not clear enough to get an panoramic shots, but the anemones were all out, and the schools of small fish co-operated. The wreck is the aft end of a tanker blown in two by a mine. The bow section drifted off toward shore, while the stern sank 12 miles off the beach in less than 90 ft of water. There is still about 20 ft of relief in the bridge section. The engine and boilers also stand up prominently off the bottom. The rest of the wreck is a jumble of twisted hull plates forming a large debris field. The wreck appears to be covered in a new skin of mussels. In a few years they will be large enough to eat. There are also groupings of anemones here and there. A few large Tog popped in and out of the wreck, nibbling on the older mussels still remaining. The bridge can be penetrated from several locations. The compartments are small with little room to maneuver. Entering one section, a group of Pollock darted away, spooked by the video lights. The bottom is covered in mussels shells from the years of growth. Other than that, the compartments are just bulkheads. Not that interesting on video. After running out of video tape, I headed for the line. The rest of the divers were finishing their second dive, and we were soon ready to get underway. A few weeks back we headed out to the Bonanza. It’s a low lying wreck in 115 ft of water. Typical of many old wooden wrecks, there’s a chain pile and boiler at one end, and a set of wooden ribs on each side. There’s not much between them on this wreck. The Bonanza is far enough off shore that it’s not hit often, and there are often many lobster. Terry and Frankie tied us in. Frankie came back with stories of giant lobster getting the better of him. Terry came back with the lobsters. Both described a large school of dogfish above the wreck. I jumped in with the video camera and a new video light reflector. 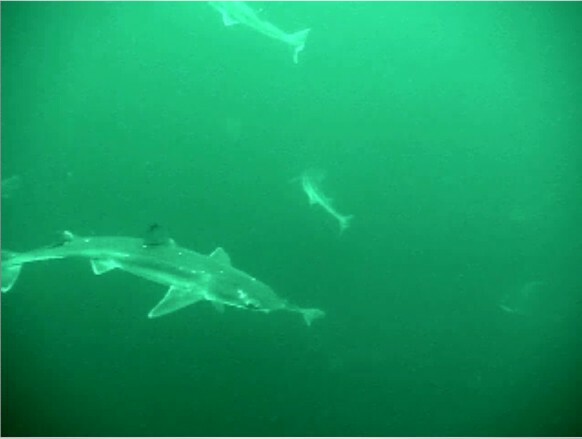 To make a long story short, there were lots of Dogfish. We figured 80-100. I’m still editing the video, but here’s a clip to give you an idea. We headed out on Sunday with a mixed forecast from NOAA. A front was scheduled to move through, it was just a question of when. As we left, we had clear skies and calm seas. The weather during the week had been rough with lots of wind and rain. This left us with a dilemma, stay inshore and risk bad vis, or go offshore and risk getting the dives cut short by the rough seas when the front came through. The final decision was to check out a new set of numbers inshore. The ride was quick since the ocean was mostly flat. There were some rollers, but nothing like last week. We were only in about 90 ft of water, but when dropping down the line, the lights went out quickly! On the bottom the vis varied from 5-10 ft at best. I turned on my light, but the reaction was like high beams in the fog. It was difficult to tell much about the wreck, but it was obviously wooden and still had at least 10 ft of relief. In the short vis, it was difficult to see all the monofilament on the wreck. However, you could feel it tugging on your gear. (One diver came back up with line and a lead sinker wrapped around his fin.) Seabass were about the wreck, but were not active. Most were hiding under the wooden planks. There were a couple of eelpouts here and there, and even a sea raven. One large winter founder passed by but alas I had not brought the right weapons. I spent most of the time looking under the boards for lobster, but only saw one of consequence. He was way back in a hole with no intentions of coming to visit. We pulled the hook and moved over to the Pinta for the second dive. Here, on with a sandy bottom, the vis was closer to 15-20ft, but still very dark. Here there were more fish about with Tog, Seabass and Cunners darting in and out of the wreck. As with last week, the anemones were out, swaying in the moderate surge. I still spent my time hunting the elusive crustacean. I found a few shorts, but nothing to bring home. Before too long, I started to feel that trickle again, and headed back to the line. This week, I’ll be on the deck with the Aquaseal.